Posted in: taking. 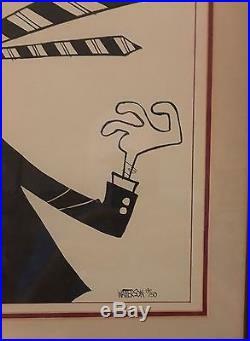 Tagged: bill, calvin, hobbes, numbered, poster-print, signed, taking, watterson. 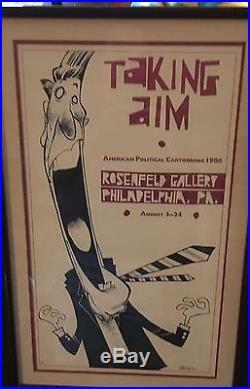 This is an original, numbered and signed print-poster, created by Bill Watterson for the exhibit Taking Aim: American Political Cartooning 1986 at Rosenfeld Gallery in Philadelphia, PA, August 3-24, 1986. This is print number 19/50, signed (printed name) by Bill Watterson. 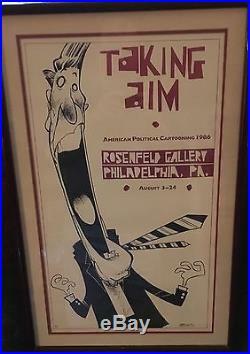 Artists caricature of Ronald Reagan is used for the design; Watterson was a political cartoonist early in his career. This is NOT a reprint or copy. As one internet “cartoonist aficionado” noted on his website. Limited to 50 copies makes this the absolute rarest piece of Wattersonity in all the universe. Take my advice: Give up on finding it. However, lacquered wooden frame has small blemishes; see photos. 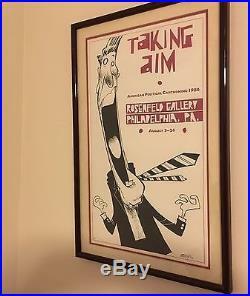 The item “Taking Aim signed, numbered Bill Watterson poster-print (Calvin & Hobbes)” is in sale since Monday, February 13, 2017. This item is in the category “Collectibles\Comics\Newspaper Comics”. The seller is “brickbats” and is located in Oakland, California. This item can’t be shipped, the buyer must pick up the item.